Hi there! I don't know about you but I think this time of year always seems hectic and the kids are extra off the walls crazy excited about everything. While I would love to sit back and cave to my secret desire to do arts and crafts all day....teaching still needs to happen! 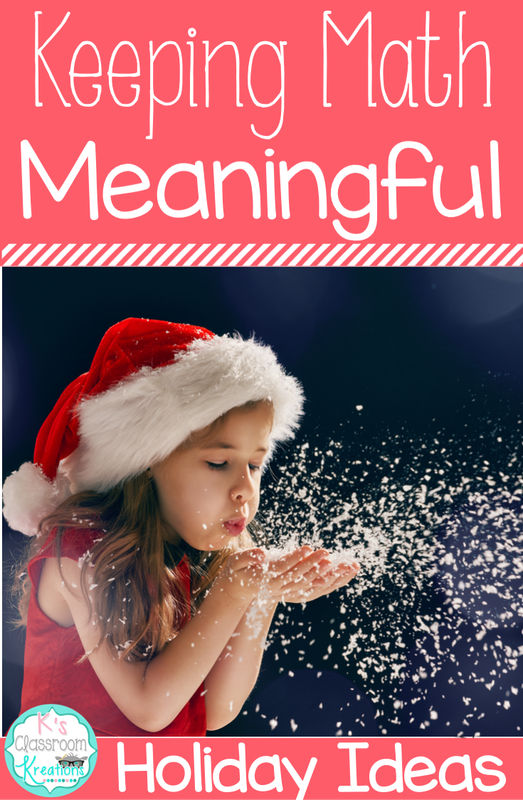 Today's Math Tip Monday link up brings you tons of fun ways to incorporate seasonal activities into math lessons, while also keeping the level of engagement and content needed. I promise to keep it short and sweet today because let's be real...life is busy! Side note, not all of the activities below are super cute/pin worthy but the kids are enjoying them and that my friends, makes this teacher happy. One of my favorite ways to get kids excited about a new season is to change up my math manipulatives. For example, we used plastic eyeballs for halloween counters, acorns in the fall, and little pumpkin beads in pie pans for Thanksgiving. This month I am busting out the jingle bells! You can find small packs at Dollar Tree or any craft store. You can also use mini ornaments. We use these for counters and manipulatives for solving math problems. Over the past few weeks we have been focusing on adding 3 numbers. Our classroom kindness elf Elvin helped inspire this anchor chart. Using themed anchor charts and word problems makes everything seem more interesting, while also keeping a focus on the topics that need to be covered. I also created an entire winter set of math pages for morning work, homework, and quizzes. Creating fun math centers goes along with using manipulatives. I got packs of mini presents at the Dollar Tree, slapped a piece of colored tape on each, and wrote a number up to 10. Students grabbed 3 presents and added them together. If you wanted to bump this up you could write the numbers down and have them tell how many hundreds, tens, ones, etc. You could also add only 2 gifts. The next few pictures are basically the same idea, just different foam cut outs (from a craft store). I put a variety of pom-poms into baggies along with index cards or post it note Keys that had a different number for each. You could also use buttons or actual gum drops. 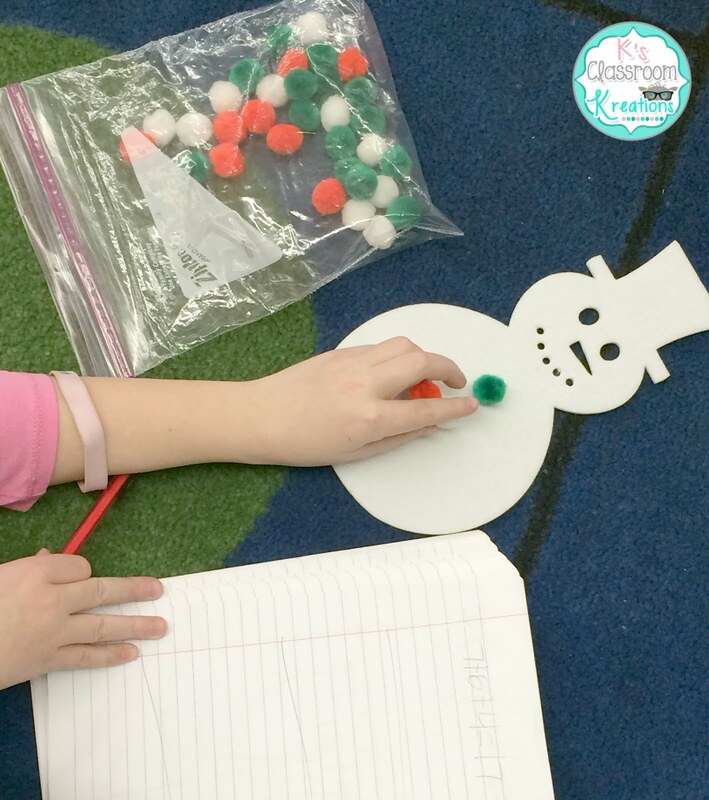 Students added 3 pom-poms based on the key and could create any combinations that they wanted. I love having the kids make crafts and strongly believe that they need time to cut, paste, and be creative. However...I do not want to the be teacher caught having arts and crafts time during a surprise observation or anything. My solution is to tie in projects with math. 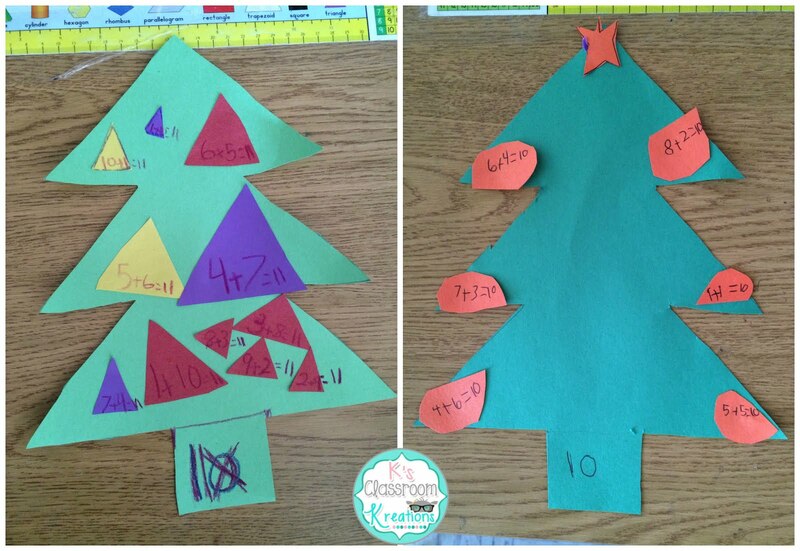 I gave each child a Christmas tree template and colored paper. You could pre-draw ornaments and copy onto colored paper but I kind of like their independence on this one (and I forgot to think ahead). They wrote a fact on each ornament that equaled the sum on the stump. I also do this type of project in literacy with word families, prefixes, categories, etc. 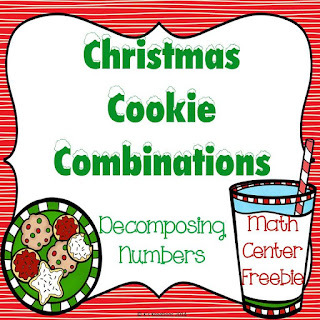 Last but not least, here is a fun way we practiced decomposing numbers. I started with a problem like "We baked Santa 7 cookies. Some were chocolate chip and the rest were sugar cookies. How many of each could he have?" The kids often get confused with these kinds of problems and end up adding some number to 7 rather than finding two parts that equal 7. 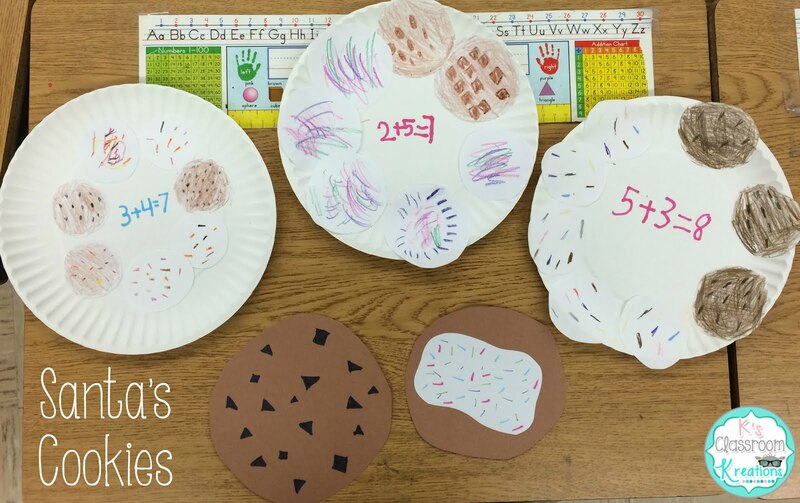 We glued their cookies onto paper plates so they would have a visual to represent this concept. I also gave larger numbers to my more advanced kids. 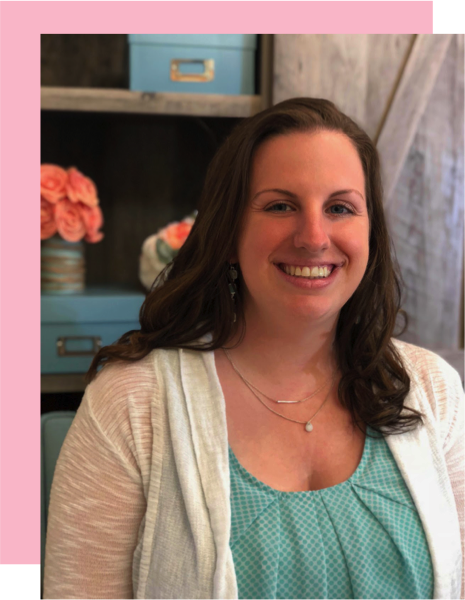 Their projects turned out so cute I turned it into a FREEBIE for you. I hope you enjoy it and can find many ways to stay on task this holiday season. Don't forget to check out all of the other ideas shared below. 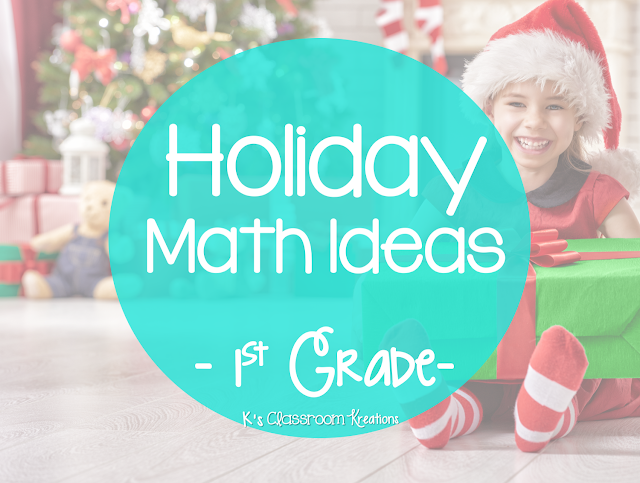 You have great ideas for keeping math seasonal and fun. I love the idea of using mini-ornaments for manipulatives. And your freebie is super cute!! Thanks for sharing. Mathematics is one of the compulsory subject for all students and in this many students failed because of the difficulties while learn formula's and steps. Moreover, it requires great understanding of the fundamental concepts, without which it is just another confusing part of the curriculum for your child. I found a more relevant blog related to math which tell us about Unforgivable Mistakes Math Tutors Make :https://smiletutor.sg/6-unforgivable-mistakes-math-tutors-make-teach-math-the-right-way/. Hope this will also help students.